Divergent, written by the American author Veronica Roth is yet another Young-Adult genre book that has been getting a lot of buzz these days. The reason is its upcoming big screen adaptation that’s hitting the theatres in March 2014. 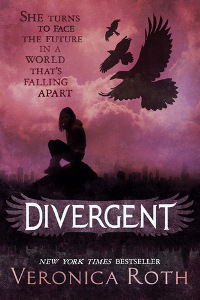 Set in a dystopian future, Divergent tells the story of a 16-year old girl named Tris (Beatrice Prior, initially). She lives in a compartmentalized society where people, according to their virtues, can chose to belong in either one of the five factions, Abnegation (the selfless), Candor (the honest), Dauntless (the brave), Erudite (the intelligent), and Amity (the peaceful). Tris’ parents belong to Abnegation, but she’s free to choose other factions now that she’s sixteen. She takes an aptitude test which is supposed to help her in choosing a particular faction. But the results turn out to be inconclusive, and she’s told by her examiner that she’s a Divergent, a misfit of sorts, who according to the diplomats, poses an unknown danger to the society, and thus has to be dealt with. When the day of Choosing Ceremony arrives, Tris chooses Dauntless over other factions. Now that she belongs to Dauntless, her initiation process begins which involves jumping out of a moving train on a regular basis, fighting other bigger initiatives in training exercises, and going through a virtual simulation which makes its subjects confront their fears. Failing the initiation would mean that she has to live the rest of her life as a factionless (which is equivalent of poverty and homelessness in our world). Starting with the world of the book; it’s not very unique or surprising per se, but I understood most of the reasons the author provides for the compartmentalization of the society. While I liked the concepts and the out-of-the-world nature of it, it also seemed plain silly at times. The story is not very character driven, but it captures the anxiety, the angst, and the alienation of a teenager who has to leave her family behind, now that she’s becoming an adult. Apart from Tris, most of the other characters strike as very generic, who are only there to fill out the pages, and provide nothing much else to the story. The narration is as simple as you’d expect in a Young-Adult book. At times, it almost feels like the author is deliberately trying not to go into specifics of some of the plot details, and hence making the narrative abstract. The whole initiation phase of Tris is surprisingly brutal and violent (is it just me or is every other YA book about kids fighting kids these days?). Simply put, the story is neither emotionally engrossing, nor a thrill seeking venture. I might be sounding a bit harsher than I intend to. But that may be because I’d read some pretty great books in recent weeks, and I’m not the admirer of YA genre that I once was (yes, I was a Twilight fan once, guilty as charged). But fans of The Hunger Games series will find Divergent a convenient read, along with people who are looking for a simple and entertaining weekend read.